SHARP TV is now gearing up for its grand launch in India. To leverage the love for cricket that this country has, Sharp has associated with Rohit Sharma as its brand ambassador. With its forthcoming launch, SHARP is gearing up to become India’s leading player in the TV segment with its range of Aquos LED TVs. “We are really excited to have Rohit on board. His technical expertise at the game, consistency and elegance, both on and off the field, resonates with our brand that stands for innovations in LED Technology through years of Japanese research and development. His presence will surely help us launch this brand in a country where he has such a huge fan following,” said SHARP TV India, Sales Director, James Yang. The brand intends to leverage the love for the sport and keep the main campaign thought intact where the campaign is that anything that you watch is always “Best Seen on Sharp”. The brand intends to extend its reach to audiences across India while the brand strengthens its network base across the country. Furthermore, the campaign will showcase a seamless integration of country’s immense love for Cricket & brand Sharp. 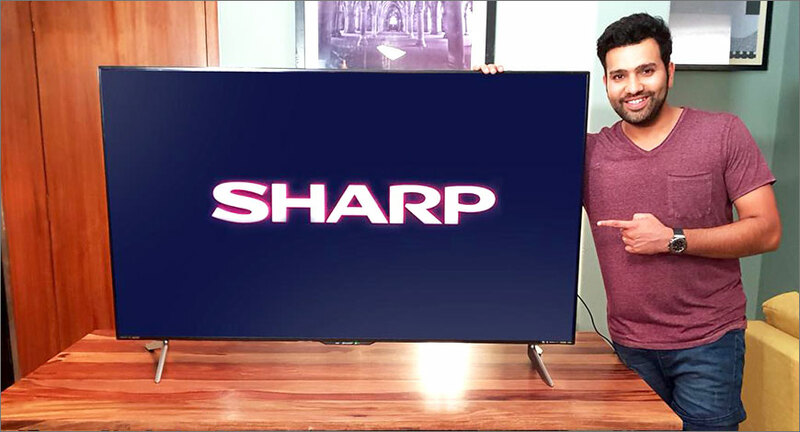 Sharing his views on the association with the SHARP, Arjuna Award winner Rohit Sharma says, “I’m delighted to be associated with a brand like SHARP. As an avid tech enthusiast, I love the brand, and any content that I watch be it sports or movies, I know it’s always ‘Best Seen on Sharp’.